Without being all "doom and gloom" and "woe is me", January has been a little bit of a write off over here for all of that lets-start-the-new-year-off-positive business (hence the current zero-existent blogging going on) but I'm not dwelling, I'm simply trying to pick things up as and when I can, and I'm moving s-l-o-w-l-y forward. But oh my goodness I'm certainly already ready for a holiday. So, when my relaxation-needing senses stumbled across Inntravel and their "Slow Holidays", well I couldn't stop myself from digging a little deeper into what they had to offer. Inntravel are a Yorkshire based (yay!) travel company who have won awards for their fabulous focus-on-the-small-details kind of holidays, encouraging people to really get themselves out there and fully explore everything a country has to offer - as close up and as first hand as possible. And thinking about it, what a brilliant way to holiday, really learning all about a new town or a city within a beautiful foreign country, yet still being able to do so at a really slow, leisurely, holiday pace. I've talked endlessly about my love of holidaying here in the UK (Staycations are simply amazing) but actually, maybe a Slow Holiday abroad could be the next step up. There is still all of that freedom to explore, to do your own thing in your own time, however there is much more chance of being surrounded by amazing weather and fabulously different cultures...hmmmm yes I think I need to explore these Slow Holiday's a little more - enjoy a holiday filled with beautiful wildlife, stunning architecture and fabulously yummy food and drink. It really does sound like an amazing concept to me right now let me tell you. I'm now quite eager to get this on my "I was here" list that's for sure. Asturias is just beautiful - grassy hills framing fishing ports and sandy beaches - it looks absolutely idyllic and a perfect place to go exploring with the little ones...especially the little ones who adore open spaces and having the freedom to run around. My own little wildling is in her element outdoors and loves to stretch her legs and burn off (some of!) her seemingly limitless energy. However that said, yes, whilst we do enjoy the odd walk and whilst Inntravel's Slow Holiday's are perfectly suited to the "walking amateur" (which we very much are) there are now amazing seven day, Asturias slow rail holidays to factor in too - a self-guided rail journey making seeing more of the beautiful country a very possible notion. It could be the perfect way to travel around, stopping at one lovely character-filled hotel to the next whilst following planned, detailed maps and route notes - slow travelling whilst also being able to rest weary, tired feet - perfection. Now food and drink wise, Asturias is very well known for it's cheese and it's cider (amongst other things of course) and in particular for the traditional way in which it's cider is poured. I mean the cider pouring is so famous it even has it's own hashtag - #AsturiasCiderChallenge - and this reach for the stars (quite literally) talent-needed skill is done as it helps to oxygenate the cider on it's way down to the glass, helping to fully release the aroma before it reaches it's destination. And so, to really get me in a full on holiday-wanting mode I was sent my very own, very traditional Asturias cider kit so I could give the challenge a try myself. ...and if we're honest all I've done is made you want to be able to have a go at the challenge yourself now haven't I? 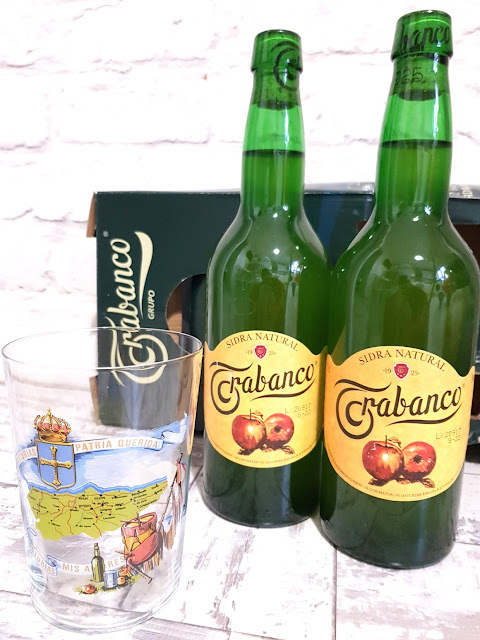 There you go, simply enter the competition above using the rafflecopter entry form (it is open for two weeks starting today) and the winner will have their very own Asturian Cider Gift Set (like the one pictured above) sent directly to them. And then you too can join in with the #AsturiasCiderChallenge - and do a lot better job than I did.